In 2019 the Vintage Motor Club members will be not only enjoying our annual events such as the traditional VMC Mountain Rally in July, our Motorkhana and a short tour on National Motoring Heritage Day but we'll also be participating in the Pre-31 Autumn Tour at Orange in May, supporting local and community events with our cars and enjoying social and sometimes competitive vintage driving events most months. January Another successful display at the Australiana Pioneer Village Wilberforce. March The Annual Easter CHMC Rally, members enjoyed touring to and around Narrabri. One of our VMC Associate members brought home the Best 1980s Car trophy. April Motorkhana with a Difference Started at Wiseman's Ferry, toured to Lemon Tree for a sociable day with some driving skills tests. 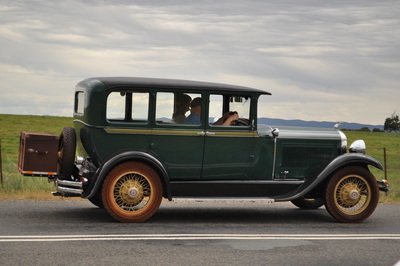 May The annual Pre-31 Autumn Tour held at Parkes was enjoyed by a large number of members and their cars. May National Motoring Heritage Day saw the VMC have a social run to Pitt Town Sports Club for lunch. July Annual Mountain Rally - toured to Gunning, Crookwell and overnight at Goulburn, great vintage motoring and an enjoyable weekend away. August Despite the wet weather we followed the wonderful Hawkesbury Artists Trail before lunching at Kurrajong. November Ladies Day Luncheon, a VMC regular event where we acknowledge our VMC ladies who drive vintage cars and the ladies who navigate them. A pleasant long lunch was held at Cafe Saligna, West Pennant Hills. December Our annual Christmas event - for 2018 we replaced our monthly meeting with an superb and convivial dinner at the Hills Motor Lodge that was enjoyed by a large number of members. January Australia Day Display Australiana Pioneer Village, Wilberforce. VMC car display. February The Neely Run including a look at the Castrol Globe at Wollondilly Heritage Centre and Museum. March Treasure Hunt Started at Woodcroft, finished at Dural with lunch - entrants gathered all sorts of "treasures" as they toured the Hawkesbury and Hills districts. May Pre-31 Autumn Tour at Orange, hosted by our great friends at ODAMC http://www.odamc.org.au was another amazing weekend of vintage motoring with over 90 veteran and vintage vehicles. July Mountain Rally, our annual winter weekend rally celebrated its 45th year, an event where vintage cars meet cold weather - in 2017 we're looked for mountains north of Sydney - yes there are some! Had a great weekend touring on some lesser used roads and seeing the Hunter region through vintage windscreens. August Concourse & Cars 90th Birthday A special day for the 1927 cars – supported by the VMC’s other vintage and heritage cars. September The Gymkhana was held on a beautiful private rural property north of Wyong. Members found out how good they are at parking their vintage car and other novelty events. November Ladies Day – a scenic vintage car drive followed by a catered luncheon near the Nepean River. November Old Hume Highway Historic Houses Tour our cars were among 45 veteran and vintage cars that toured National Trust properties - Retford Park Bowral, Riversdale Goulburn and Comma Cottage, Yass. Heritage cars at heritage houses. December Christmas Function, our Club year finished with a Christmas Dinner and social evening. Contact us if you wish to receive further details of our Club events or if you have memories or photos of VMC cars and events to share. ​See our Photo Gallerys pages for previous VMC event photos and reports.